Bare shoulders and pastel stripes for the win. 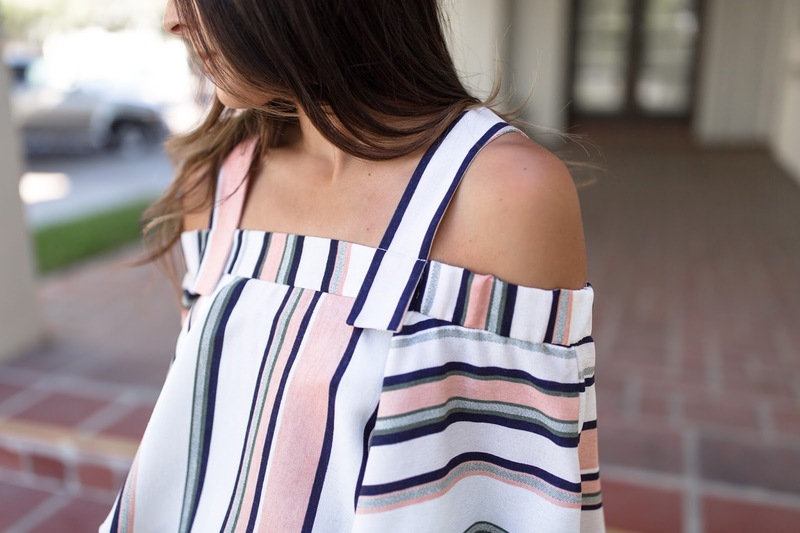 This statement romper is one of my favorite summer finds. This summer I was a guest at a wedding (which is rare since I'm a wedding photographer), so when the time came to decide my outfit (that morning) panic ensued. I was running around town trying to find a last minute dress or something...anything! It was especially difficult because I was already showing in my pregnancy but hadn't announced it yet, which would make for awkward conversations. I remembered seeing this romper on a mannequin and just figured it was a safe choice. Turns out it was not only a safe choice, but after trying it on and adoring it, it was one of my favorite outfits in my closet. It also looks so much like a dress but has the comfort of a romper. Win! In other news, I ran my first race ever this weekend. 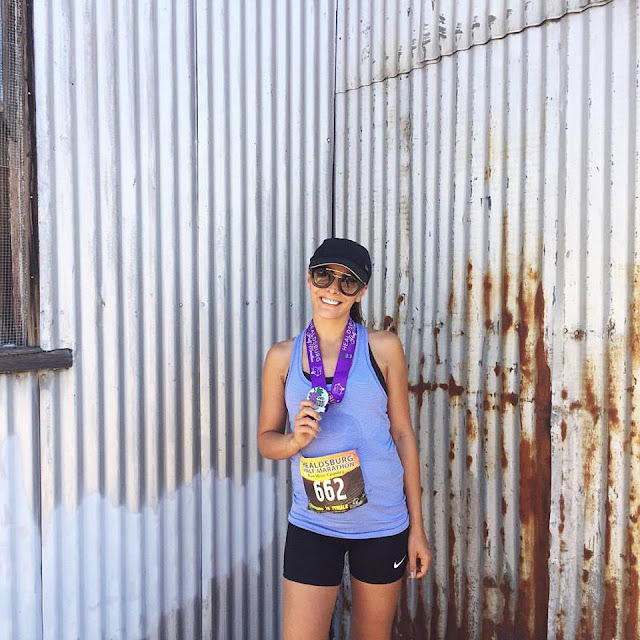 It was the Healdsburg Half Marathon and I was so excited to have done something like that during my pregnancy. As I've mentioned before, I had been running before and during my pregnancy to stay healthy and decided to sign up for a half marathon in July. I completed one long distance run a week in addition to 2-3 shorter runs. As time went on, my long distance run changed from 5 miles to 10 miles and my shorter runs ranged from 4-6 miles, so I would average 20-25 miles a week. I'll be honest, even with being pregnant and running longer distances, I have never felt better in my life. Ever! I have even more energy than before, I'm waking up earlier with ease (big, big change), and pretty shocked to have actually followed through with some type of active-activity. The half marathon was incredible and something I would have never thought I could do last year when I would barely make it through a mile. Not kidding! I didn't want to set a goal for the race, but just to be healthy and safe for myself and the growing babe! I was able to finish in 2:09 with a 9:45 pace. It was so exciting to see my time, all my hard work pay off, and Uriah and Nick waiting for me at the finish line. I won't be running another half marathon until after the baby comes, but I do have a 10k in a few weeks that I'm looking forward to. Now I need to treat myself to some new running clothes!